Not only locally-sourced and gluten-free but in business over a decade. Clinton Wilkins Mortgage Team is a must-stop shop for anyone in Halifax purchasing or refinancing a home. Halifax’s Clinton Wilkins Wins Canadian Mortgage Broker of the Year (under 25 employees) in the 2018 Canadian Mortgage Awards. Clinton sits down with CTV News’ Bruce Frisko to talk about the release of his new book; Confessions of a Halifax Mortgage Broker. Clinton Wilkins sits down to talk with CTV News’ Bruce Frisko about the July 12 BOC benchmark rate increase. In case it impacts the average homeowner. 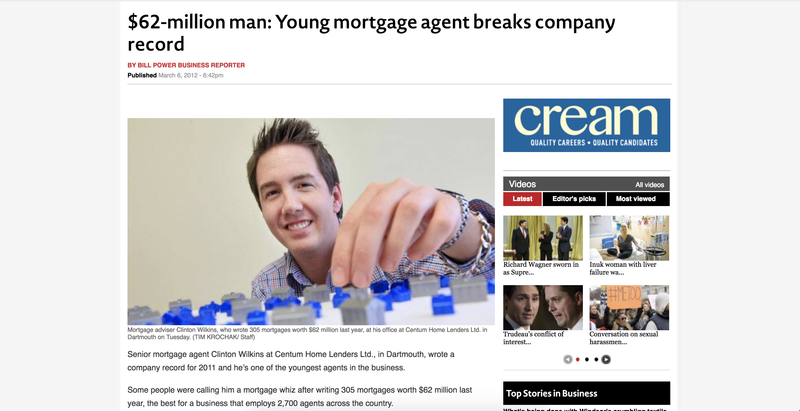 Senior mortgage agent Clinton Wilkins at Centum Home Lenders Ltd., in Dartmouth wrote a company record for 2011. Also, he’s one of the youngest agents in the business.